"Why are you telling me this, Felix?" He shrugs, his eyes focusing on the painting behind me. "I had to let you know that things get better," he signs with honest fingers. "You just need to live alongside your deafness, not in spite of it." 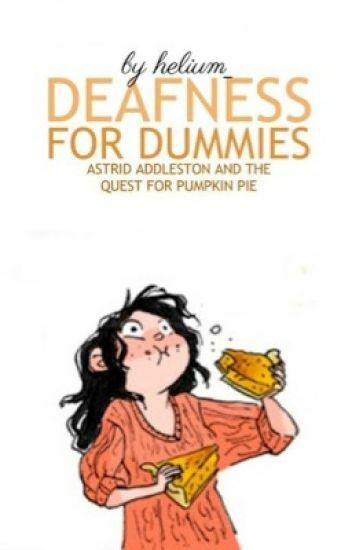 After Astrid Addleston - former Cambridge law student and resident all-rounder - crashes into a tree at too-many-kilometres an hour, she finds herself lacking something very important- her hearing. With only prejudice and a despondent mood for company, Astrid resigns herself to the idea that her life and ambitions are in ruins. A pretty girl and a boisterous cooking class full of deaf teenagers are determined to show her otherwise. "The unfixable; the shattered; the torn; the broken. They all come here. It's my job to remake them, because once its broken there is no going back to the way it was. It must be remade." Six individuals. Six unique stories. Five exercises. One room. One mirror. One therapist. One goal. Odette is put into group therapy after one-on-one therapy doesn't work. She meets four other people who have gone through the same thing she has. She also meets her group therapist Cleo Patricks. Cleo's methods for therapy might not be what some people call "ethical" or "compassionate" but they have been proven to work -- or that's what the medical journals say. Why seize the day . . . when you can seize the Tuesday? Teddy has no say in the matter. He has to seize the day, every Tuesday, at the community centre where he has been roped into running a class. What on? He doesn't know. Who with? It becomes all too obvious. Maia Edwards is dead, and has been for five years. Unfortunately for her, the afterlife isn't rosy and angel-filled. Maia's a Traveller, forced to journey through others' bespoke Heavens until she is deemed worthy of her own. After crossing through a thousand Heavens, Maia is bored, lonely, and feeling dismal. That is, until she meets Eli. When Dependents (servants bound to specific Heavens) with glowing green eyes and the strange ability to cross over like Travellers start appearing near the two Travellers, they are thrown into a war like no other - a war between life and death. Pitted against the ruler of the Heavens, Maia learns that there's a lot to lose, even in the afterlife. Because once you are dead, you can't die again - unless you have never lived. Bored of good girl bad boy stories?????? This is the place for you. Check out some of the different and my favourite stories on wattpad. PERSONAL ASSISTANT NEEDED. People skills optional. Ability to take drink orders preferred. Personal mode of transport a MUST. Nobody in their right mind would respond to a help wanted listing so vague. Enter, Robin Banks. The wacky exploits of a narcoleptic super villain and his reluctant sidekick. 1955. Unsuspecting boy. Big-hearted girl. Small-minded town. Invincible summer. © ALL RIGHTS RESERVED. 2014. D. A.